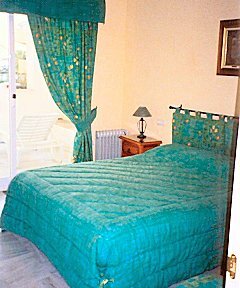 Prices charged are in Euros - Sterling price is a guide only. La Cala is a gem in the crown of the Costa del Sol, once a small fishing community the village has inevitably become popular with tourists, but has not been over built. There is a distinct lack of high rise buildings. The development of the village has been very carefully and successfully managed. You will find a broad selection of restaurants and bars in the old village - along the beach some charming cafes specialising in exotic and refreshing drinks. 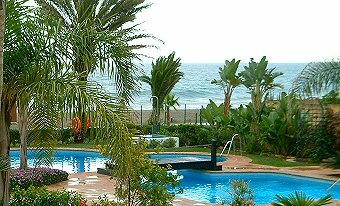 Marbella, Fuengirola and all the attractions of the Costa del Sol are within easy reach. The Airport is Only 20 minutes from La Cala and help with transport is available if required. Right on the edge of a beautiful sandy beach at La cala, this two bedroom apartment is in the most idyllic setting possible. Sit on a still summers evening on your terrace and listen to the waves washing lazily against the shore. Go bare-foot from your apartment down to the sea for an early morning swim - and be the only person there - you will not forget La Cala quickly. The apartment has two Spacious bedrooms plus two bathrooms. The living area is furnished to the highest standard. with modern kitchen complete, right down to the dish washer. 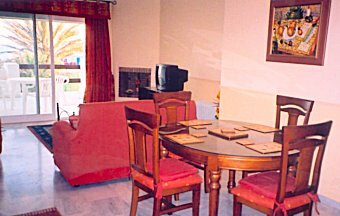 The small apartment building is in a quiet spot at the end of the beach, only 5 minutes (flat) walk from the centre of La Cala. Our apartment is not only perfect for your summer holiday but the ideal retreat in the winter months - close to the shops and yet so wonderfully quiet - apart of course from the waves lapping against the beach.